CLASSIC Join a Guided Excursion aboard a Vistadome train with spectacular panoramic views of the lush countryside of Urubamba Valley. Travel by rail to Aguas Calientes to take the winding road to legendary Machu Picchu. Participation in this vacation requires purchase of the following flights from Avalon Waterways, not included in pricing: (1) roundtrip air from your U.S. gateway, starting at $1,394 (based on Miami, departure in January, 2019) and intra-vacation air segments; or (2) intra-vacation air segments only. 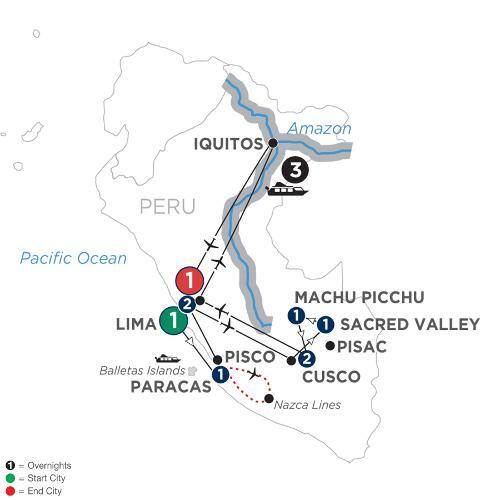 Required intra-vacation air segments are: Lima/Cusco; Cusco/Iquitos; Iquitos/Lima. Air prices were effective on February 7, 2018, and their availability is limited. At the time you purchase your tour, air prices may be higher. All prices are per person based on double room occupancy. Prices shown above include cruise in a Suite. Upgrades to Upper, Corner, or Owner's Suites are available.